Barter Books : Cervantes [Miguel de Cervantes Saavedra]; Jarvis, Charles [tr.] 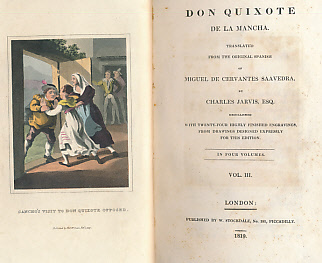 : Don Quixote de La Mancha Translated from the Original Spanish of Miguel de Cervantes Saavedra by Charles Jarvis Esq. 4 volume set. Stockdale Edition. 220 x 140 mm (9 x 6 inches) - lxxxviii,376pp; vii,403pp; xvi,370pp; viii,440pp. G+ : in Good condition plus with marbled eps and edges. Cover slightly rubbed. Some offsetting and light scattered foxing. Book-plates on paste-downs.